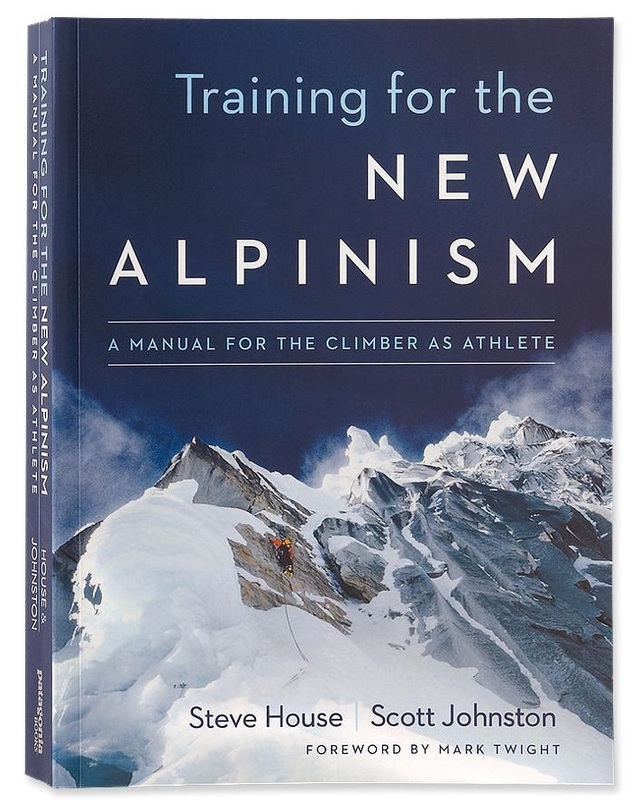 This is a new book on training for alpine climbing, by uber-alpinist Steve House and elite sports trainer Scott Johnston. There are tons of books on the market that deal with getting in shape for various sports, (including rock climbing) but to my knowledge, this is the first and only book that focuses on training for alpine climbing. I was expecting the book to be somewhat dry and boring, because I don’t really look at the topic of fitness and training as an exciting subject. However, the book is remarkably engaging and interesting to read. There are terrific climbing photographs, stories and anecdotes from the lives of accomplished climbers, and the book is written in a very straight forward and accessible style. I bought the book with the expectation that it would be a boring, textbook-like treatise, and found it to be quite enjoyable as well as useful. The challenge of alpine climbing is that you need to be able to build endurance for the long moderate sections of a big alpine climb, and power for the technical cruxes. Not surprisingly, this book focuses on two main goals; improving endurance, and improving strength. To increase endurance, the authors recommend lots of training just under your aerobic threshold. For strength, the general advice is for using free weights and/or body weight exercises that build max strength without adding unneeded bulk. One of the most useful things about the book is that it includes both theory and practical application. The book provides specific recommendations on various exercises and training regimens, and includes detailed descriptions of various exercises to do in order to increase strength and endurance. There are sample schedules for how to incorporate strength and endurance training into an integrated program, and specific recommendations on how to time the various cycles to correspond with your anticipated peak climbing seasons. If you wanted to, you could just follow the specific examples in the book. However, there is also great deal of exposition of the theories behind why certain methods of training are preferred over others. The book explains the underlying principles behind the recommended methods, timing, etc. This is great, not because I care intellectually about the science underlying the specific recommendations, but because it allows me to figure out how to adapt the general principles to my personal situation, and still remain inside the parameters that will allow the routines to have their intended effect. For example, rather than just telling readers to go out and hike up hills for a long time, the book goes into great detail about the theory of endurance training and what constitutes an effective regimen. It establishes the parameters of “Zone Training” with “Zone 1” being the level of effort that is right under your aerobic threshold, and Zones 2 through 4 progressing ever higher above your aerobic threshold, with increasing reliance on anaerobic metabolism. The authors are big proponents of lots of training in Zone 1 as a way to increase your endurance. They provide the theoretical basis behind these recommendations, and give the readers various options (from simple to complex) for assessing which zone you are training in. For me, that means that with the aid of this book, and a bunch of trial and error in identifying my aerobic threshold, I now have a target heart rate that I’m aiming to maintain during my Zone 1 endurance work outs. I can use this basic concept to tailor my training to the book’s precepts, no matter what sort of training I’m doing, from indoor training on a treadmill or stair stepper, to outdoor training, hiking up trails or backcountry skiing. I also have a feel for how I should prioritize my training. Before reading this book, I was doing too much Zone 2 and Zone 3 work, and not enough training in Zone 1. I assumed that working myself really really hard for 20 minutes was “better exercise” than an hour at a more moderate pace. The book has shown me the error of my ways, and I’ve turned that around now, and spend the majority of my endurance training in Zone 1. The good news is that a long training session in Zone 1 doesn’t make me think I might die, like a Zone 2 or 3 (or 4) work-out would. The bad news is that my Zone 1 sessions are significantly longer than my old anaerobic Zone 2-3 workouts. I’m spending more overall time working out, but it’s at a lower level of effort. The other good news is that it seems to be working. My aerobic threshold heart rate is slowly increasing, and I’m able to maintain my Zone 1 workouts for longer periods of time while recovering faster. So, it appears that after about a month of putting the book’s recommendations into practice, I’ve already seen some positive results. The book also addresses a number of other topics beyond strength and endurance. Some, like nutrition, are broadly applicable, but there are other topics that are climbing specific, such as the mental stresses associated with danger, and challenges of high altitude. I really like this book. Even though I’m not an elite athlete and never will be, there’s tons of useful information in this book even for a mediocre mountaineer like myself. It’s taught me how to tailor my training for those qualities that are most important for climbing. Given the positive effects that I’ve seen after only a month, I’m excited to track my progress over the next year. This book definitely deserves a place on the bookshelf of anyone who is interested in alpine climbing, no matter what level they are climbing at. This entry was posted in Backcountry Books and tagged a manual for the climber as athlete, book review, mediocre mountaineering, scott johnston, steve house, training for the new alpinism by Kai. Bookmark the permalink. I’m not a climber but a swimmer. And I’ve found this information very useful as well. Its principles are applicable to any sport. I’ve used the zone method of training for years, but their breakdown of zones is different than the one I’ve been using, which is basically from USA swimming. As I result, I realized that I’d been spending too much time in the “black hole,” 75-80 percent of MHR. I’m into endurance hiking in the Adirondacks and am currently training for a single day of 15,000 feet of elevation gain. I read various books on training that are written for runners, ultra-runners and triathletes and I extrapolate to my situation. No need for extrapolation with this excellent resource. After the first reading on my Kindle device I ordered a hard copy because it’s too difficult to flip back and forth on a Kindle and flip back and forth anyone will probably need to do . My gym workouts will change completely and will be better directed with logical progression. I too have slowed down my endurance sessions and feel better. If, like me you are a reading fiend, two excellent companions to this book you would enjoy (in spite of some overlap of information) are 80/20 Running by Fitzgerald and the Well-built triathlete by Matt Dixon. House and the people he is writing for have devoted their lives to their passion. The rest of us with day jobs have to downsize our goals and training regimens intelligently or we will become fit and unhealthy and risk burnout, unhappiness and athletic starvation. This is well explained in Dixon’s book.